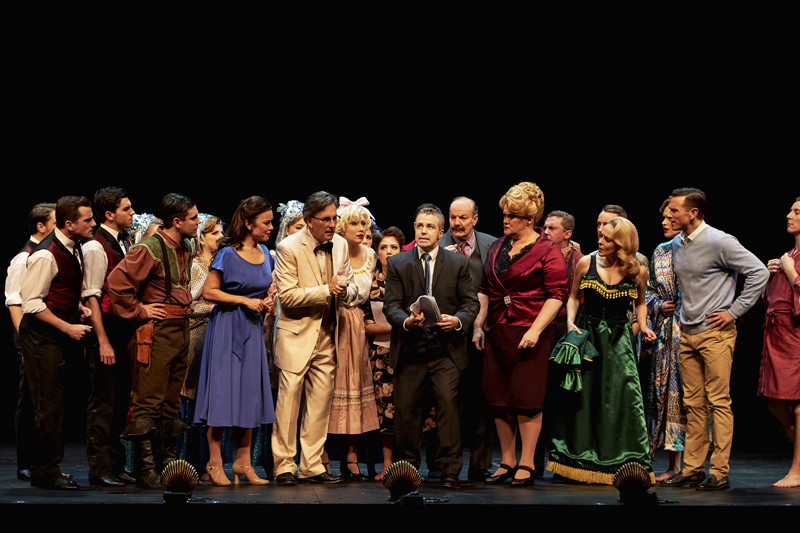 Brimming with toe tapping tunes and laugh-out-loud puns and punchlines, the Australian professional premiere of Curtains is a fresh, welcome entry to the 2016 Melbourne music theatre season. Imagine a cross between Murder, She Wrote and Smash and you have the basic idea of backstage murder mystery musical, Curtains. Rupert Holmes’ book derives much humour from the self-important vanity of various music theatre types, placing a large company of actors and creatives in lockdown when the untalented leading lady of show-within-a-show Robbin’ Hood is (somewhat mercifully) murdered. 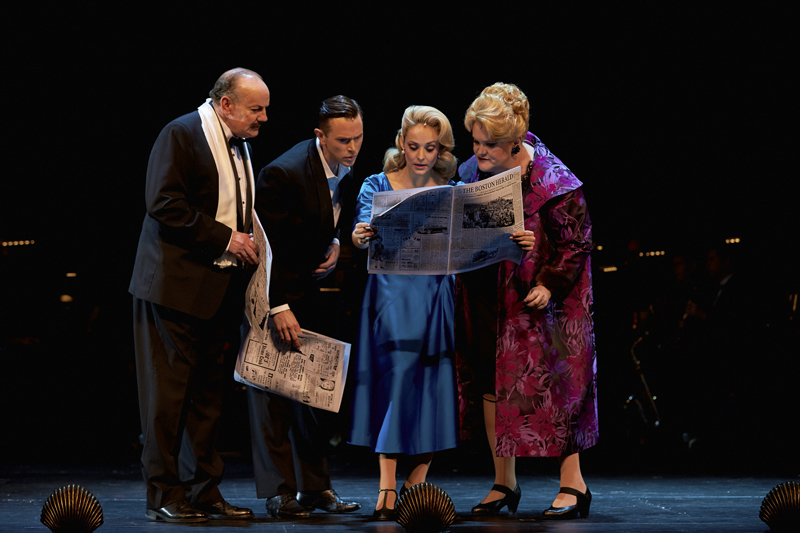 Premiering on Broadway in 2007, Curtains had a respectable run of over 500 performances but failed to inspire the kind of success that leads to a production in the West End and beyond. In a limited season playing to music theatre lovers, the show is an ideal choice for The Production Company. 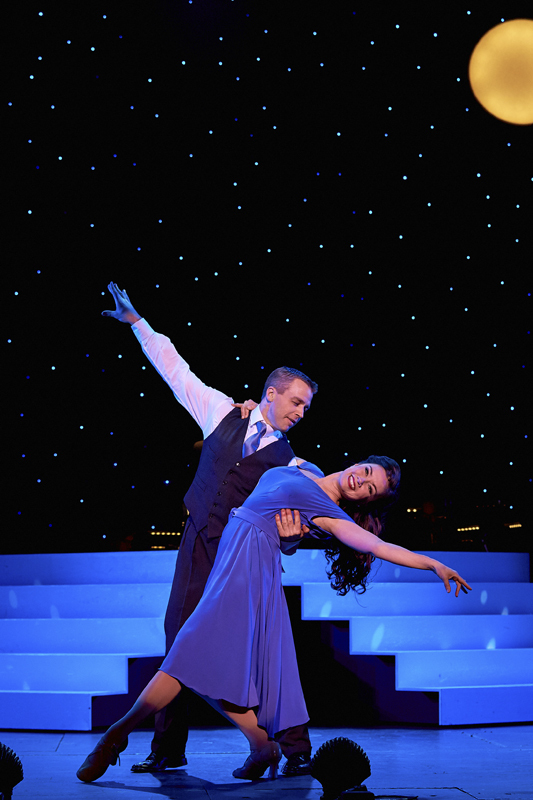 Kander and Ebb’s score provides splashy production numbers, gentle ballads and comical charm songs, all easy hummable on first listen. 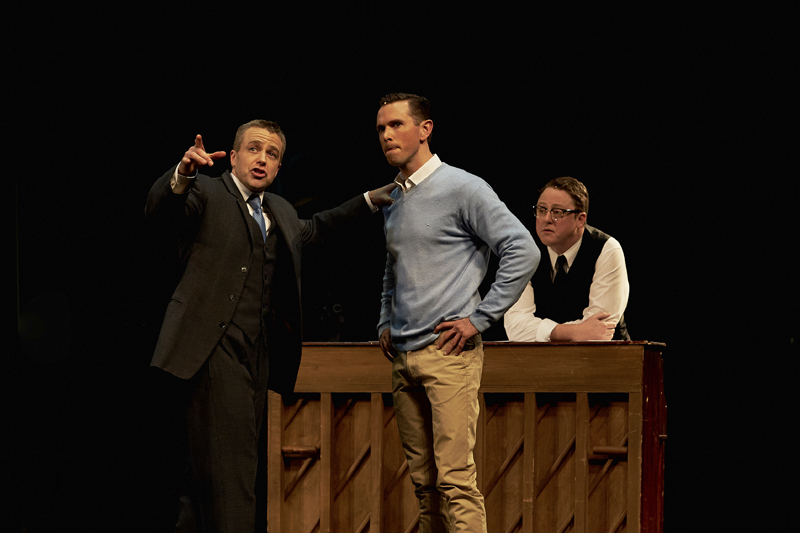 By rights, “Show People” should be a popular anthem on par with “There’s No Business Like Show Business.” The writers shoot some well-aimed barbs at critics in “What Kind of Man?” Robbin’ Hood numbers poke delicious fun at Oklahoma! and other early Golden Age musicals. Most delightful of all is “In The Same Boat,” which is heard in three incarnations throughout the show before reaching a glorious climactic punchline when all the versions are sung simultaneously. Director Rodger Hodgman has done a sterling job of establishing the menagerie of characters and landing the comedy during the relatively brief rehearsal period. When there is time to add a gay love triangle within the male chorus it is clear that rehearsals have run smoothly. There is a slight overload of dialogue as the whodunit is finally solved, but comic momentum is well sustained over the 165 minute running time (including interval). 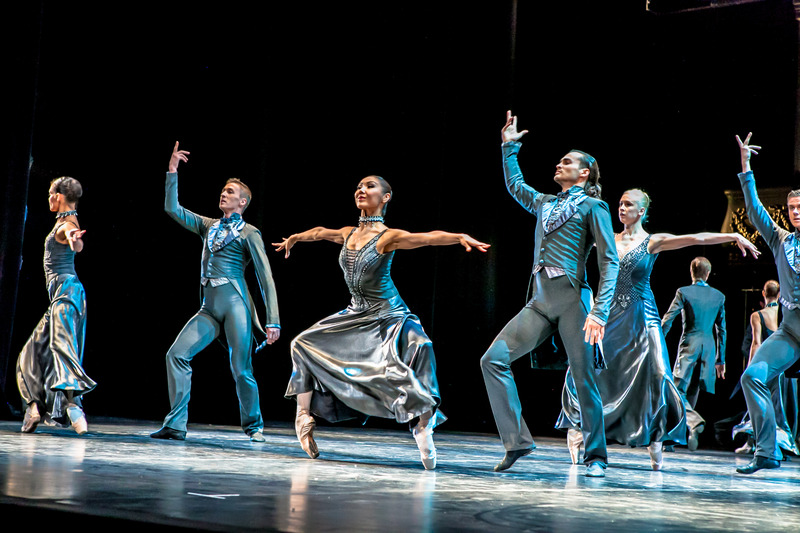 Dana Jolly contributes witty choreography that is gently blended into the action. 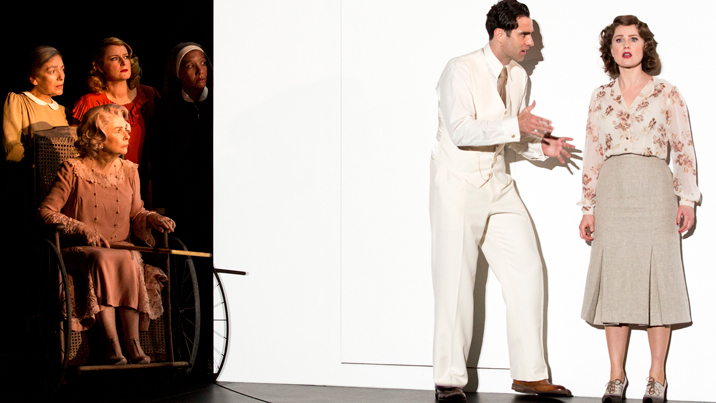 Musical director John Foreman not only conducts the expertly prepared musicians and singers but also plays vital role of conductor Sasha Iljinsky, delivering some lovely vocals at the top of act two. Christina Smith’s set design is occasionally underdone as a sea of black, but is offset by full, colourful sets for Robbin’ Hood and a large set of rich red curtains for the Boston Theatre where the show is enduring its out-of-town tryout. Esther Marie Hayes’ vibrant costumes clearly establish and maintain the wide range of characters. Untalented diva Jessica Cranshaw’s hot pink wig and sequined satin gown are wickedly garish, and the bloomers on the Robbin’ Hood girls are too perfect. 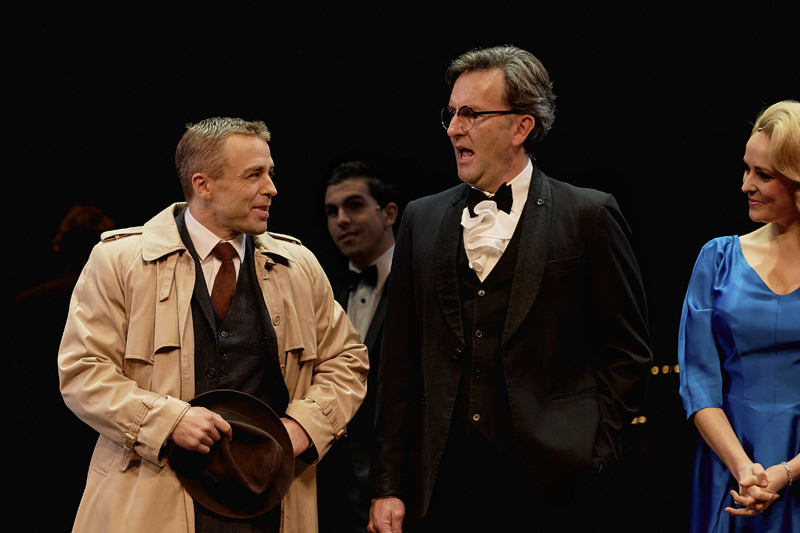 Filling David Hyde Pierce’s Tony Award-winning role of Lieutenant Frank Cioffi, Simon Gleeson delivers an expertly realised characterisation that is as magnetically compelling as it is neatly understated. Gleeson nails the high-toned Boston accent and scores many a well-earned laugh as Cioffi’s obsession with fixing the show increasingly outstrips his interest in the solving the murders. All this, plus he dances treble time-steps. Stalwart veteran Melissa Langton, a long-time supporting artist, shines in a well-deserved leading role that plays to her strengths of ballsy comedy and vocal belting. When driven producer Carmen Bernstein finally shows a softer side, Langton makes the most of the chance to balance her vocals with some truly lovely softer singing. Alinta Chidzey is a delight as doe-eyed ingénue Niki Harris, maintaining a glowing, charming presence that underpins the character’s fascination to men. Chidzey joins Gleeson in dreamy dance number “A Tough Act to Follow,” in which both performers exhibit bright, breezy flair. Charming actor Alex Rathgeber makes a welcome return to The Production Company as one half of writing team Aaron Fox and Georgia Hendricks. Talented actress Lucy Maunder is well cast as Georgia, giving the character a gorgeous blonde look and singing the role beautifully. Zoe Coppinger makes a splash in the ditzy role of ambitious chorine Bambi Bernét, performing with infectious energy. 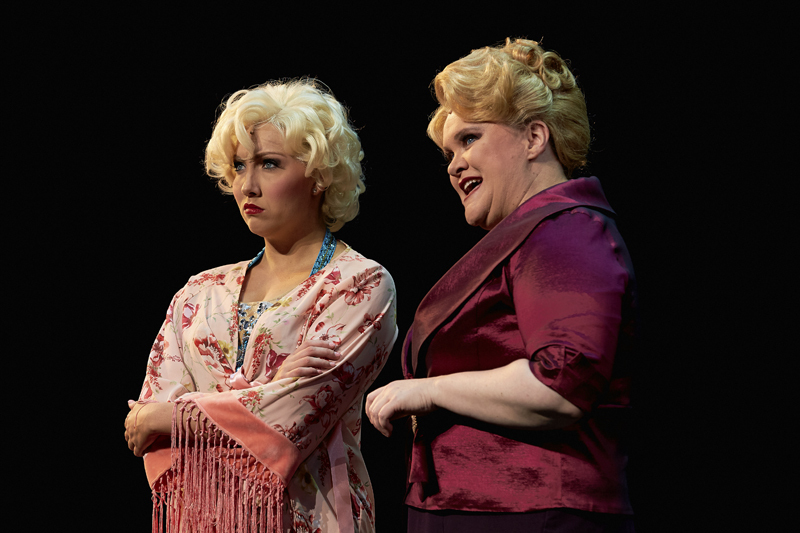 Coppinger’s singing in the role is very strong, although her dancing is not quite at the level to make the extended solo in “Kansasland” as effective as it should be. The well-written role of conceited director Christopher Belling scores many laughs, despite Colin Lane’s dull performance and awful, wandering, faintly British/Australian accent. Nicki Wendt is a scream as clueless, ill-fated diva Jessica, setting the comic standard very high with her choice cameo role as the show opens. All music theatre lovers are sure to enjoy Curtains. Attendance is especially recommended for those who clamour for new work amidst the ongoing abundance of revivals. 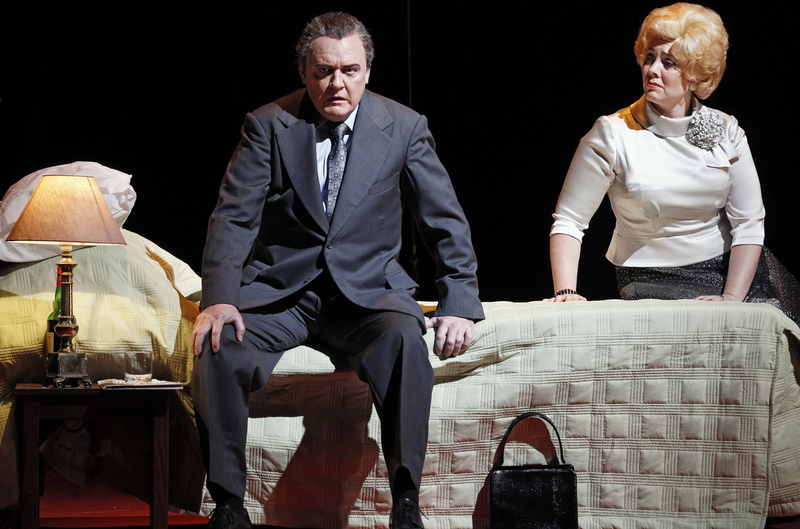 Curtains plays at State Theatre, Arts Centre Melbourne until 28 August 2016. I’ve just been to see Curtains. What a show. What a cast. Everyone was amazing. I am so glad that I went to see it. Thank you for your exceptional review of this show. So glad you had the chance to see Curtains, Nick. Wish I could have gone again. Too busy with my school production this week. Bravo to The Production Company for doing such a great job with a show we all wanted to see!